It’s been awhile since our last post, so we have quite a bit to share. After a second great summer in Tasmania, it was time to say goodbye and start the long trek up the east coast of Australia. After stops in Flinders, Eden and Bermagui, we are currently in Sydney. 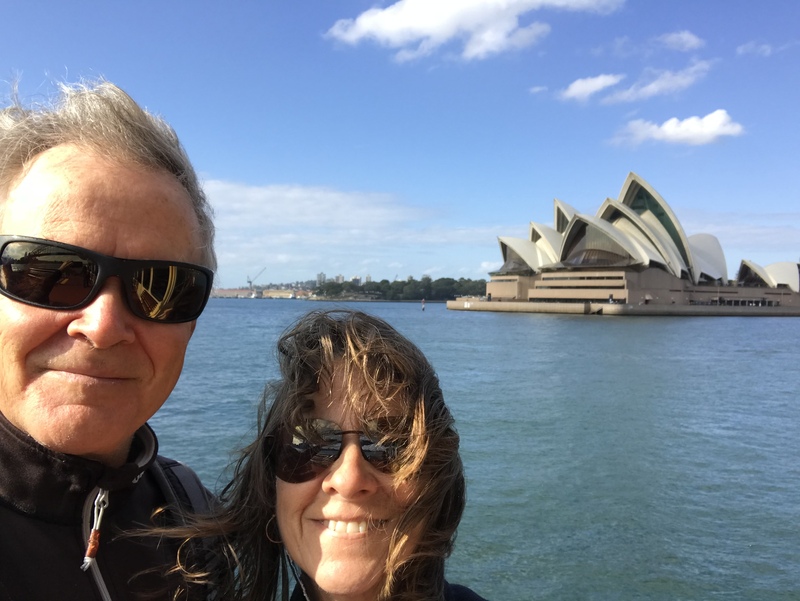 We skipped Sydney on the way down the coast a year and a half ago, so this is the first time for us (other than transiting through the airport a few times on the way back to Canada). We arrived just as Vivid Sydney, a three week festival of light began. Everything is lit up at night in bright colours. Pretty cool. What else is new? Well we got a new crew member before leaving Tasmania. A four legged one. 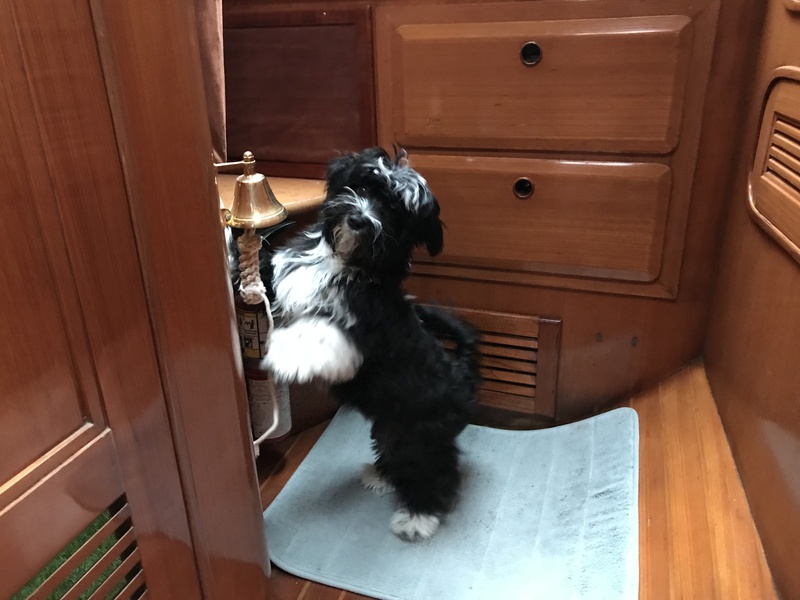 His name is Scupper, a Havanese puppy. Now five months old and weighing almost three and a half kilograms, we have our own Tasmanian Devil. What where we thinking! After we had to put Brandy down in Panama seven years ago, we said “Never again a dog on the boat”. To be fair, she was to old and to big for the boat, but she adapted well. After house/pet sitting last winter in Tasmania, we got the dog blues when our house sitting was over. So we said, “let’s get a dog”. Crazy thing to do, especially when you travelling around the world on your boat. But you have to live your life every day, not hope for what you may do in the future. 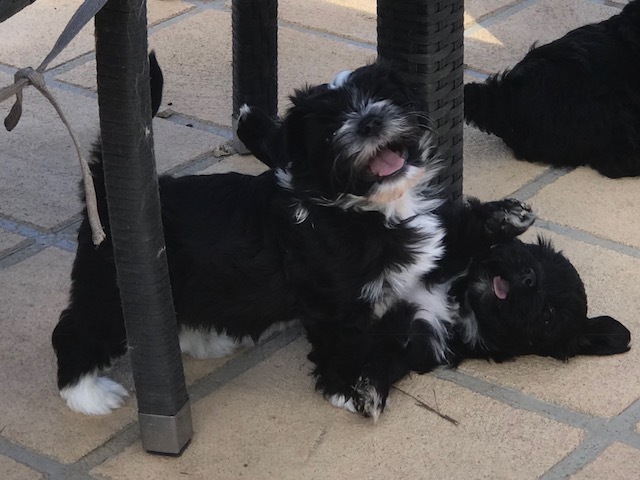 So after a bit of research on what type of dog would be best for us we settled on a Havanese. They adapt well to new environments, have a good temperament, and only grow to about 4-7 kg. We contacted a breeder last August and arranged to pick from the litter that was born January 3rd. He joined the boat at nine weeks, and we departed Hobart about a week later. 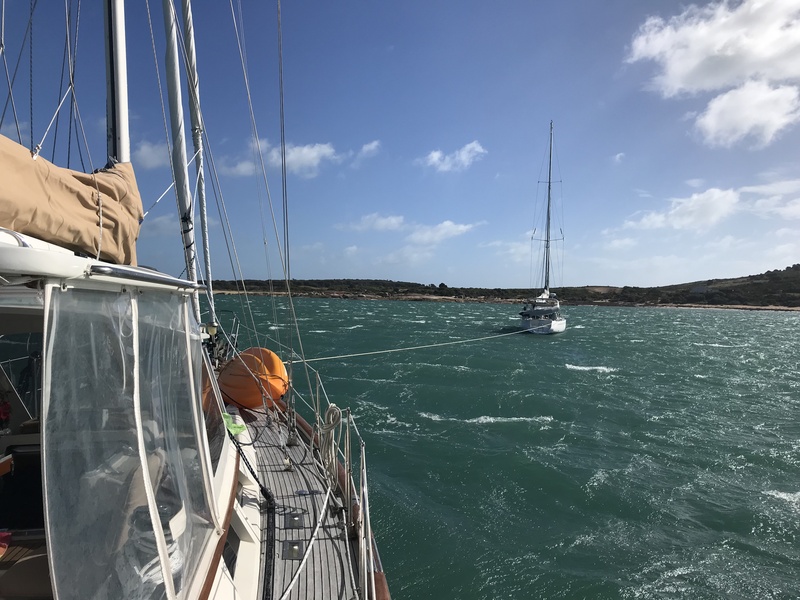 We picked a terrible time to cross Storm Bay (there’s a reason they call it that), one of the most uncomfortable sailing days we have ever had. Poor Scupper threw up and we thought this will not be good going forward. Turns out his baptism by fire turned him into a good little sailor. Since then nothing has bothered him travelling at sea. He probably will be better at this then we are! Anyway we are having lots of fun with him. A bit of extra work but well worth it. One more thing to mention about Scupper. He is “boat trained”. He does his business on some artificial grass on the forward head shower floor. To notify us of his intentions we installed a brass ships bell on the wall next to the door. He rings for us to open it for him. Smart dog. To smart in fact, as he found out is was also a way to get extra reward treats. We are going to get the bell engraved. One side will say Wee Wee, the other Room Service. Enough about the dog. Here is a recap of our last summer in Tasmania. Early December we really enjoyed cruising Norfolk Bay. We visited the site of the coal mines that were operated by the prisoners of Port Arthur. While anchored in Murdunna, we met two cruising couples, Tim & Carol (SY Rassimonde) and Chris & Margie (SY Storm Bay). Chis and Margie got us hooked on Japan, as they had spent 18 months cruising there. More on that later. 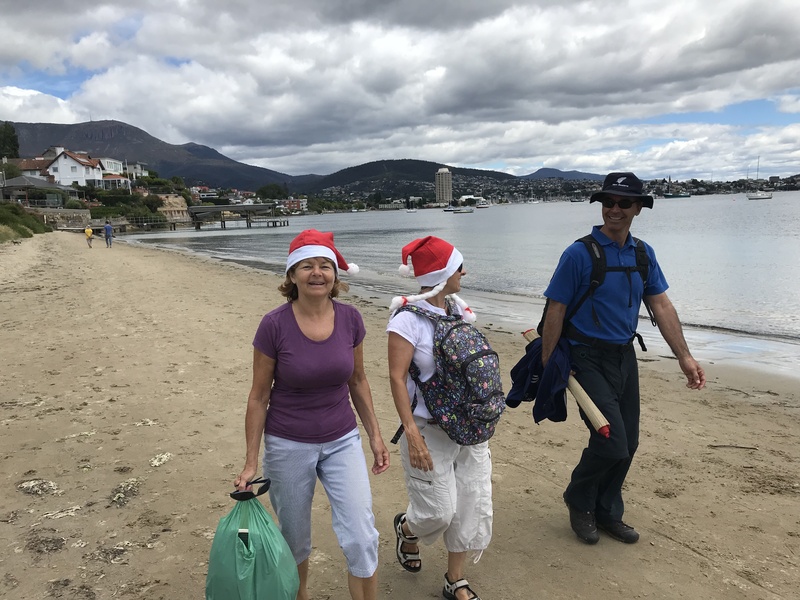 Just before Christmas we sailed back to Hobart and spent time with Joanne and Serge (SY Spirare), our fellow Canadian friends who we keep bumping into over the last seven years. Then it was back down to Cygnet for the big Folk Festival mid January. We had a fantastic time. Next was our haul out where we had the joy of painting the bottom again. Actually I enjoy that time to work on the boat and Kettering was one of the best yards we have been in. Next haul out will be somewhere in Malaysia. We also spent some time on the east side of Flinders Island, a very special place but also placed smack in the Bass Strait where Mother Nature can really show her stuff. We knew we were going to get some very strong westerlies with a front and following low that was forecast to come through. There are not a lot of great anchorages with protection from the west, and the whole area is notorious for bad holding due to all the sea grass. We anchored on the east side of Prime Seal Island, which we thought would give us adequate protection and waited. There is one mooring ball there but already taken by our friends on Aurielle. The next morning when the front came through we had a gust of 59kts pull up our anchor up but it reset. For the next two days we did not see wind much below 40kts, and that first night we found ourselves dragging and re anchoring multiple times. One of the few times in eight years we couldn’t get the anchor to set. Our Rocna is a great anchor but not the best in weed. 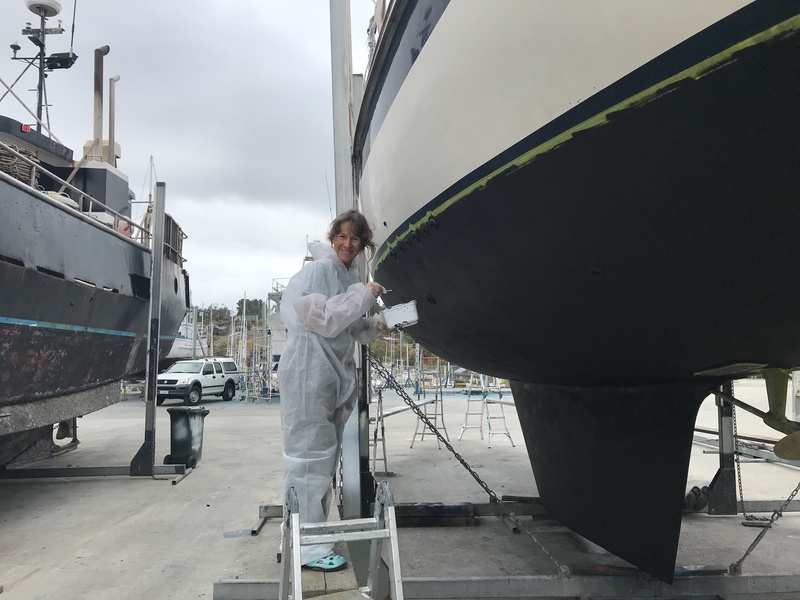 The next day Aurielle called and offered us the chance to tie off their mooring as well. We gladly accepted and finally had some rest the following night. Sadly, friends of Aurielle who were anchored a few miles up the coast lost their boat that same weekend, even with two anchors down. Luckily the crew was ok. Speaking earlier about Japan, we were interested in perhaps doing a trip there then over to Hawaii, and back down to Micronesia. Liliane likes to plan these scenarios out with rough dates and travel times on paper. One afternoon while Scupper was supposedly having a nap in his soft crate while we were on shore, he chewed his way out the crate, jumped up on the sofa in the main salon and shredded the Japan/Hawaii plan to little pieces. He was quite pleased with himself when we arrived back. We figured that he didn’t like that plan, so that is out. In reality, it would have added a year to our travels and bringing a dog into Japan and Hawaii is not that easy. So we will continue our journey up the coast to Darwin, then sail to the Raja Ampat area of Indonesia in November. Unless Scupper eats that plan. We have added new pictures in the Photo Gallery section (Tassie to Sydney 2018) as well as changed our Position page since adding Iridium Go. Check it out. Congrats on Scupper. He is adorable. We have a new arrival as well. Carla had a little girl Aria and Audra is expecting a little girl in August. We are blessed. Glad to see all is well.